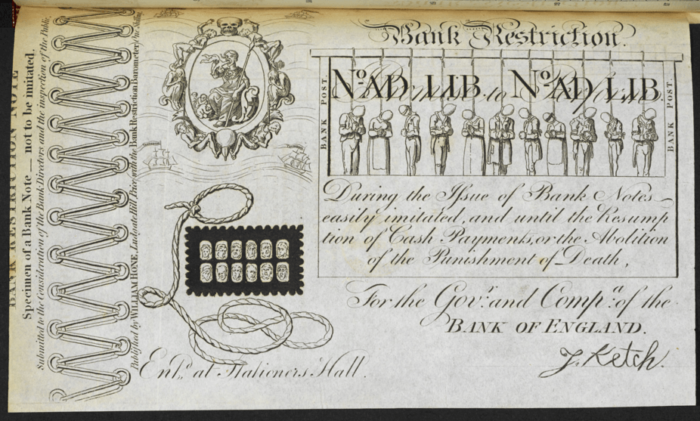 Satirical Bank Note (1820), highlighting how easy it was to be hanged for spending fake money, despite how prevalent it was. George Cruikshank and William Hone. The claim that immigrants or minorities are more criminal than the general population is a common trope. From Donald Trump’s claim that Mexicans in the US were “bringing drugs … bringing crime. They’re rapists”, to the frequent portrayal of African-Americans as having a criminal mentality, to how black men are disproportionately stopped by the police under “stop and search” laws in the UK. Other studies have explored how “driving while black” can increase a drivers’ likelihood of being charged with a traffic offence. People have long blamed those unlike themselves. Are immigrants and minorities more criminal than locals, or just more likely to get caught – or even just more likely to be blamed? An example of Irish living in London at the beginning of the professional police era shows that who ends up in front of the judge is more dependent on how the crime is policed than on who is responsible. If police tactics unduly target minority groups, then this inflation of the criminal statistics can, and has, been used to paint minority groups in a negative light. London experienced a massive crime wave between 1797 and 1821, linked almost entirely to counterfeiting and forgery. The problem got so bad that people began to worry if the cash in their pocket was real – aware that they could be executed for knowingly spending bad money. Bank notes had only recently been introduced in England and, as historian Randall McGowen has remarked, they were “scarcely more than a printed form with a number, a date and a clerk’s signature”. Forgers even had the gall to produce the fake bank notes in prison, selling them onward for a fraction of their face value to anyone brave enough to attempt to pass them off in the city’s shops. Even coinage, then comprised of actual silver and gold, was at risk. Talented button makers and engravers turned their attention to the technically similar processes of making false coins, which would be made with a cheaper metal and rubbed with aqua fortis (nitric acid) or aqua regis (a mixture of nitric and hydrochloric acids) to make the fake appear either silver or gold respectively. Soon the city was crawling with fake money, including more than 250,000 forged banknotes. Patrick Colquhoun, a magistrate of the era, estimated 120 sellers were each distributing hundreds of false coins onto the city’s streets. He singled out the Irish as one of the problem groups behind the crime wave. Peter King’s previous research on Irish crime claimed the justice system did not show an anti-Irish prejudice and that the Irish criminals got what was coming to them. Certainly there are records from London’s courtrooms to support this. For example, Irishmen John Fennell and James Gillington were arrested in 1799 after having allegedly forged more than 600 bank notes with a home-made printing press. But at the other end of the spectrum the records are filled with Irish such as John Brown, who tried to pay for his glass of gin at the pub with a false coin. Looking at the numbers alone the Irish do seem to have been a problem – but these numbers hide the extent to which policing strategy affected who got arrested in the first place. Initially, the authorities relied almost exclusively on tips from shopkeepers who had been offered false money. It fell to them to detain suspects and call for the watchman who would make the arrest. This meant people spending false money had a far greater chance of getting arrested than those involved in the more profitable aspects of manufacture and wholesale. The Irish were more involved in the petty but very public act of spending the money – those aspects of the crime most associated with poverty. As new arrivals, the Irish were at a further disadvantage, and cunning locals were only too happy to trick their new “friends” into buying a round at the bar with the false coins they supplied. With the system of policing set up to almost exclusively target these minor players, the courtrooms filled with poor Irish which led to their reputation for criminality. Despite these arrests the problem of forgery worsened. So, in 1812, the Bank of England changed its strategy, encouraging specialist detectives to hunt for the real counterfeiters. With generous rewards as incentives, these detectives soon managed to infiltrate the criminal networks. This often involved using accomplices in the crime to trick the counterfeiters and wholesalers into selling to an undercover agent, in exchange for a reduction in their own sentence. For the first time the Bank was encouraging local criminals to “out” other local criminals and, as they did so, the ethnic makeup of defendants appearing in the court began to change: the number of English defendants rose 27-fold in the years immediately after the change in policing strategy. This research highlights what gets missed when policing focuses on crime perpetrated by ethnic minorities. No one at the time noticed the dramatic reduction in Irish defendants but, by the 1810s, the claim that the Irish were behind the forged currency crime wave was unsupportable. This wasn’t because the situation had changed for the criminals, but because the police had changed where they were looking for them – and discovered that the real culprits behind the crime wave were the local English, and probably always had been.